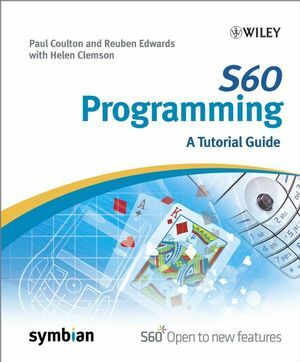 Based on the authors' experiences in developing and teaching Symbian OS, this practical guide is perfect for programmers and provides a series of example-based scenarios that show how to develop Symbian applications. Discusses how the move toward 3G technology has resulted in an increasing need for mobile application development for S60 devices. Reuben Edwards and Paul Coulton are well-established researchers in the area of mobile systems and applications. As World leading academics for Symbian education, they are part of the Nokia Symbian Educators Group, which have been trained to the same standard as all Nokia Symbian developers. They run the only MSc in Mobile Games Design and M-Commerce Systems in the World and they have formed a company, which specializes in Mobile Applications Development. 1 Introduction to Mobile-Phone Systems. 1.3 Elements of a Mobile-Phone System. 1.4 Keeping Users’ Calls Separate. 2 Introduction to Symbian OS. 2.1 The Development of Symbian OS. 2.2 Symbian OS User Interfaces. 3.1 Creating a Console Application. 3.4 Putting It Into Practice: An Engine for a Simple Card Game. 4.1 The Structure of a Symbian OS Application. 4.8 Putting It Into Practice: Creating a GUI-based Card Game. 5.4 Changing the Application Title. 5.7 Files, Streams and Stores. 5.8 Putting It Into Practice: Saving Your Name and High Score. 6.4 Putting It Into Practice: The Blackjack Game. 6.5 Getting Your Application Onto a Phone. 7.7 Putting It Into Practice: A Bluetooth Messaging Application. Appendix B Specifications of Phones Based on S60 for Symbian OS.